The Ceterus™, a new prosthetic foot from Ossur's Flex-Foot® product line, mimics the body's natural twisting motion, providing responsive rotation for a smoother range of motion. As the user pivots on the foot, the Torsion Control Cell™ is gradually twisted and compressed, providing a steady, elastic movement with no abrupt stops. Both rotary forces on the knee joint and shear forces on the residual limb are reduced, allowing amputees to fully enjoy numerous activities. The Ceterus features a built-in vertical shock pylon which absorbs impact to the residual limb during the entire stance phase and is fully adjustable for optimized function. The slim profile of the Ceterus is easy to cosmetically finish. The foot is ideal for amputees weighing up to 325 lbs (146 kg) with low and moderate impact levels. WBC Industries introduces its newest and most innovative product: leather-like, vinyl-backed hook and loop straps. These ultrasonically welded straps are backed with a waterproof, marine-grade vinyl. These straps are soft and patient friendly-and unlike any other straps currently offered. Packaged in ten straps per bag, the straps are available in three colors: black, white, and sandstone. Dimensions are 1 in. x 18 in., with four "cut-off" strips, and 2 in. x 18 in., with four "cut-off" strips. Weight for large size is 8.6 ounces. 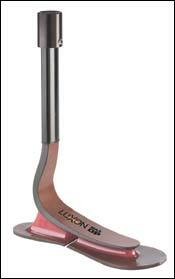 The LuXon™ MAX DP (Dynamic Pylon) is the newest member in the LuXon elastomer series from Otto Bock. Otto Bock pushed the design of this foot system to its logical extremes: A lightweight and comfortable pylon foot with superb flexibility, lively feel, and natural motion. This is exactly what you would expect when radical meets extreme. Otto Bock offers a 60-day satisfaction-guaranteed, no-risk trial. A new line of titanium componentry, TiMed, is now available from Fabtech Systems. 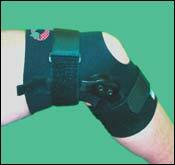 This German-engineered prosthetic componentry provides highest quality at affordable prices. TiMed components are made from special 3-1 titanium alloy, making the material 20 percent stronger than typical 6-4 alloys most commonly used for titanium components, but just as lightweight. Each piece is forged and machined to provide more strength than bar stock commonly used in the O&P industry today. TiMed components are rated with weight limits of 250 lbs. and 300 lbs. All titanium components are backed by a two-year warranty on quality and workmanship. Ohio Willow Wood's Impulse™ Foot is a low-profile, high-tech energy-storing foot for active amputees. This new prosthetic foot is designed from the revolutionary composite material used in Ohio Willow Wood's award-winning Pathfinder™ foot. The Impulse Foot consists of a foot plate-made of the Pathfinder composite material-that is attached to a recessed Kevlar®/nylon keel. Amputees who have been among the first to experience the advantages of wearing the Impulse Foot have said, "The response from the toes of this foot is amazing!" and "The bend and give of this foot make me feel stable." 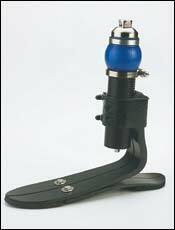 The Impulse Foot can be used for endoskeletal, exoskeletal, or Symes applications.